This blog has the best readers; I have the best friends. When I posted the other day about my Johnnycake, I received not one but two family recipes for cornbread that, I was assured, would not even vaguely resemble the flatbread that my vintage recipe produced. Now, I would argue that first, the Johnnycake wasn’t bad at all, but it’s also not really cornbread per se – and certainly it was not what I was expecting. But I’m quite happy to be the recipient of family recipes, especially as I don’t have many of my own. The grill situation prompted another email, this one from a friend in Seattle, who tried to save my plans to grill a flank steak for a dinner guest with the offer to loan a spare charcoal grill. I had already decided on an alternate menu, but it still felt good to know I had that kind of support. I needed the support, because the one thing that didn’t get resolved was my dishwasher situation. Sure, I had bought a new dishwasher, and it was scheduled for delivery last Thursday. Sure, the delivery guys showed up right on time, and one disconnected the old dishwasher while the other set about unboxing and unloading the new one from the truck. And all was well, or at least seemed to be headed that way, until the guy from the truck came inside the house without a dishwasher, and instructed the other guy to reconnect the old dishwasher. I don’t want that one, I told him. I want the new one. No you don’t, he told me. That one appears to have been dropped at the warehouse. I inquired how someone could drop an entire dishwasher and then not, you know, notice this small fact before loading it onto a truck for delivery. Happens quite a bit, he replied. The good news is that sometimes the store will upgrade you to a better dishwasher if they don’t have another one of yours in stock. That sounded great to me, although I would consider a dishwasher that fills with water all by itself to be an upgrade from my current situation. Apparently the store also considered it such, because they offered me the exact same dishwasher and a delivery date a mere two weeks off. I didn’t have time to dwell on this; I had a dinner to make and a house to clean and well, dishes to do. I amused myself through the more drudge-like tasks by trying to visualize what sort of a person drops a dishwasher without noticing, and when bored with that, what sort of coworkers could be in the same space as this and not notice the presumably loud noise that accompanied this event. Try it; it’s fun. All things considered, it seemed best to make a meal that I’d made many times before, successfully. I clipped this pasta recipe from Bon Appetit magazine many years ago. It’s from Diva Restaurant in the SoHo section of New York City. 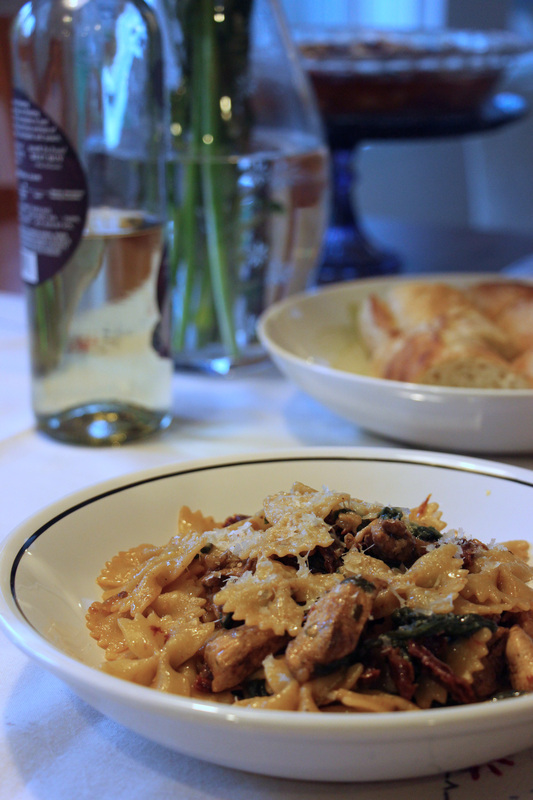 It was originally made with orecchiette, but I find farfalle works well. I also have reduced slightly the amount of chicken from the original recipe, because it seemed like a lot to begin with. I haven’t changed anything else except to make some slight modifications to the cooking instructions for simplicity sake. I tried once to make this recipe without chicken, to see if The Child would eat it; I found it bland and pointless without the seasoned chicken which my dinner guest pronounced, very robust and almost meaty. It occurs to me that portobello mushrooms might be a good substitute in terms of texture, and could absorb much of the same flavor from the marinade; I’m going to tinker with it and see if it works. If it does, this recipe may resume its place in the regular meal rotation in my house – it’s flavorful and really not complex. The biggest “trick” to it is simply to remember to marinate the chicken ahead of time. Combine 1 tbsp oil, Worcestershire, vinegar, red pepper, rosemary, and 1 tsp garlic in a large zipper bag. Add chicken, coating thoroughly. Let marinate for at least one hour and up to 5 hours. Heat a pot of salted water; cook farfalle until al dente. Drain, rinse, and set aside. Remove chicken from marinade and cut into bite-size pieces. Heat 1 tbsp oil in a large skillet over medium-high heat. Saute chicken until cooked through; remove chicken from pan and set aside. Heat remaining oil in the same skillet. Add shallot and remaining garlic; saute until golden, about 3 minutes. Stir in sun-dried tomatoes and saute until shallots are tender, about 2 minutes. Add spinach and stir until wilted. Return pasta to large pot. Add spinach mixture and chicken, toss to coat. Add stock. Stir over medium heat until stock is slightly absorbed, about 5 minutes. stir in ¼ cup parmesan. Transfer to serving bowl, season with salt and pepper, sprinkle with remaining parmesan, and serve. The original recipe calls for six chicken breasts for four servings; I've never made it this way, but if you feel like it needs more chicken, go for it. You can use any similarly shaped pasta. On Friday, I dropped The Child off at school, drove home – and then almost immediately drove back to school to retrieve her when it turned out that she really didn’t feel good. She couldn’t keep anything down for a few days, even Gatorade. She slept on the sofa, mostly, while I did things around the house and in the yard, until it started raining hard, and I headed indoors and joined her in front of the TV. There wasn’t much food in the house, and by dinnertime, I had no desire to head back out to the store. What I had on hand would have to do. Happily, though, I had some eggs, so I was able to pull together one of my fallback, quick meals: A frittata. I use Mark Bittman’s basic recipe from How to Cook Everything , and then simply toss in whatever cheese and vegetables I have on hand. In my house, it’s usually Gruyere cheese, except Costco stopped selling my favorite variety, and since I haven’t found anything that comes close to it, I’ve been forced to start looking for a new standby cheese. I had some aged Cheddar from Trader Joe’s, which was marvelous, and paired well with the spinach and red pepper that I bought to make a salad with and … well, didn’t. 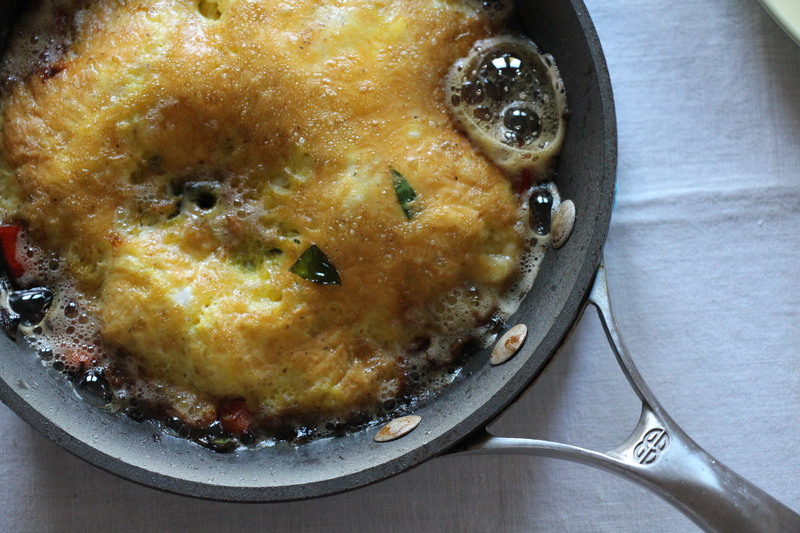 I know a frittata – unlike it’s cousin, the omelette – can be, and often is, served at room temperature, but I like to serve these hot, puffy eggs immediately so that they’re hot from the oven. Since they cook fairly quickly using the broiler method, I like to get my plates prepared before I start cooking, so everything is ready to go when the frittata is done. I usually serve them with just a bit of crusty bread alongside. In warmer weather, though, a frittata at room temperature is a nice brunch or lunch meal when served with a bit of salad. It’s simple and satisfying. Frittatas are versatile, too, because you can throw in pretty much whatever you like – so you can use up your leftovers. Play around with combinations and see what you like. There’s no hard-and-fast rule to them: Just keep the proportions the same, and have fun experimenting. Note that the recipe below serves four: I cut the quantities in half and used a smaller (eight-inch) pan. One key difference between a frittata and an omelet is that in a frittata, all the ingredients are added to the eggs, and then everything is cooked together. You can add any combination of ingredients that you like, as long as the additions are cooked if needed beforehand (and cooled briefly before adding to the eggs). Saute the peppers and spinach briefly in olive oil, then remove and let cool. Beat together the eggs and grated cheese, and mix in the spinach and peppers. Heat olive oil over medium heat in a large oven-safe skillet (a 12 inch skillet is good). Pour in the egg mixture. Let cook undisturbed for about 10 minutes, until the bottom has set. While the eggs are cooking, turn on your broiler. Transfer the pan to the broiler, and cook until the top is golden and puffy. This will only take a minute or so, so keep a very close eye. Remove from the oven, cut into wedges, and serve. I like to finish my frittata under the broiler, because I'm usually pretty hungry by the time they are done. But if you prefer, you can bake them in the final step. If you do this, preheat the oven to 350 degrees before the first step, and at the end, bake the frittata until completely set and not runny, about 10-20 minutes.